Limited Edition: 110 copies Worldwide. 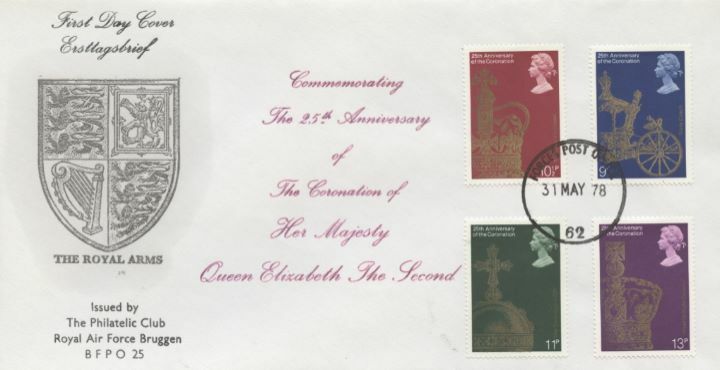 The above Royal Mail Coronation 25th Anniversary stamps were issued on 31 May 1978 by Royal Mail and feature the following stamp designs: 9p State Coach; 10 1/2p St Edward's Crown; 11p Orb; 13p Imperial State Crown. The The Royal Arms first day cover with the Forces Post Office CDS Postmark postmark has been produced by Forces and features these stamps which can make a very collectible and lovely gift.